Notice from Department of Pathology. The Combined Department of Pathology and Bacteriology was started in 1913 under the chairmanship of Lt. Col. H. J. Walton. The course of MD (Pathology ) was started in 1918. Lt. Col. H Stott made special contributions in assembling the museum, which is one of the best in the country. The department was shifted into a newly constructed building in 1955. In 1960 the department was upgraded by the central government to provide enhanced facilities for postgraduate training and research. During the 1970's remarkable developments took place leading to the creation of various subspeciality laboratories housed in the newly expanded building. 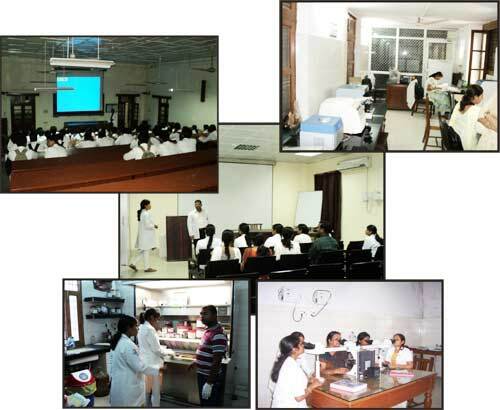 At present, the main units in the Department of Pathology are Morbid Anatomy, Histopathology, Cytology and Immunocytochemistry, Frozen Section, Hematology, Lymphoma- leukemia registry, Hepatology, Submicroscopic Pathology, Chemical Pathology and Clinical Pathology, Neuropathology, Immunopathology, molecular genetics and Cytogenetics. Automation in Chemical Pathology took place with the installation of autoanalyser. 24 hour emergency pathology services are provided at Emergency Pathology Lab and Trauma Centre lab. The State Blood Bank has been upgraded as a modern blood bank with facilities for provision of blood and various components. This is situated in an independent fully air conditioned adjacent building and provides round the clock services on totally voluntary blood donations. A Coagulation Laboratory has been set up with facilities for factor assays. Hormonal and serum tumor markers are available on cost to cost payment basis. The department is providing training to State Pathologists of Regional Diagnostic Centres of the state. The department has enrolled candidates for PhD course run by the university. Medico Voluntary Blood Donation Socoety (Red Ribbon Club) constituted with about 600 voluntary registrations. Apart from teaching and research , the department also provides clinical pathology services. The department has hosted the Annual Conference of the Association of Pathologists & Microbiologists of India twice - in 1957 and 1994. In the Centenary year 2005, a State level CME, Dinker Memorial Oration and All India Seminar on Hemophilia were organised.